Murder by Gaslight: Illicit Infatuation. On the surface, George and Fanny Crozier were a well-bred, churchgoing couple in a happy and stable marriage. But not too far beneath the surface, George’s “illicit infatuation” with 18-year-old Minerva Dutcher, had long been the subject of rumor in the small town of Benton, New York. With Fanny Crozier’s sudden death in the summer of 1875, George’s desires became public knowledge, and small-town gossip turned to damning evidence against him. George and Fanny Crozier were prominent, highly-regarded citizens of Benton, near the village of Penn Yan in the Finger Lakes region of New York State. Both came from good, moral, families and regularly attended Benton Center Baptist Church. In 1875, the couple—he 42 years old, she 39—had been married for twenty years and were making preparations for the marriage of their only son, Frank. On July 15 of that year, Fanny Crozier was suddenly and without warning taken ill. She experienced severe burning pain in her stomach and back, dry throat, and mouth, and an intense, nearly constant thirst. She partially recovered, but on the night of July 27, she had another serious attack. The next day her physician, Dr. Barber, diagnosed her with gastritis and prescribed powders of sub-nitrate of bismuth, which were administered by her husband. The prescription did not help, and on July 29, Fanny Crozier died. Mrs. Crozier was buried two days later, and the tragedy would have soon faded into memory, but for nagging suspicions of friends and neighbors. Up the time she was stricken, Fanny had given no indication of anything but perfect health. Her husband had behaved suspiciously and seemed to be resigned to the fact that Fanny’s situation was hopeless. In her dying hours he had turned away friends and relatives who came to bring help and comfort, and he adamantly refused to let anyone else near the prescribed powders. He told Dr. Barber that he did not want a post-mortem examination done on his wife. Suspicion went beyond George Crozier’s deathbed behavior, those who knew them could see that the Croziers’ relationship was becoming strained and that George was not as faithful as he should have been. He had been inappropriately familiar with an 18-year-old girl named Minerva Dutcher. In fact, though not arousing suspicion at the time, the familiarity had begun four years earlier, when Crozier would stop by her school, and the teacher would give Minerva permission to go outside and chat with him. George Crozier had probably met Minerva Dutcher at the Baptist Church where both sang in the choir. He sat directly behind her in the choir, and they would pass notes to each other and find opportunities while in church to steal away and chat privately. By 1875 the Croziers did not go to church together; Fanny would ride with her brother-in-law, and George would walk, more often than not meeting up with Minerva. George Crozier’s “illicit infatuation” with a girl twenty-two years younger than he became the talk of the church. To help out his father, Frank Crozier went, with his new wife Emma, to live at his father’s house. George told them they were not needed, as he had hired Minerva as his maid. They moved out and the following Saturday Minerva moved in. George and Minerva did not go to church that Sunday. Suspicion became so widespread in Benton that an official investigation was demanded. The coroner ordered the body exhumed and the stomach and liver removed for analysis. John S. Towler, professor of chemistry and toxicology at the Medical College of Geneva, New York, did the analysis and found sixty grains of white arsenic, absorbed and unabsorbed in the stomach—enough arsenic to kill twelve people. The circumstantial evidence was strong enough to indict George Crozier for the murder of his wife. The indictment had caused a schism in the Baptist Church between those who thought Crozier guilty and those who did not believe it was possible. By the time of the trial the whole town was divided, while most believed Crozier was guilty, a large contingent stood behind him. The evidence against George Crozier was circumstantial but compelling. Witnesses testified to George’s behavior before his wife’s death, including his relationship with Minerva. There appeared to be no one else with the opportunity or motive to kill Fanny Crozier. While not disputing the fact that Fanny Crozier was poisoned, the defense came up with two possible alternative scenarios. First, they asserted that the powders prescribed by Dr. Barber, sub-nitrate of bismuth, were known to contain small amounts of arsenic. 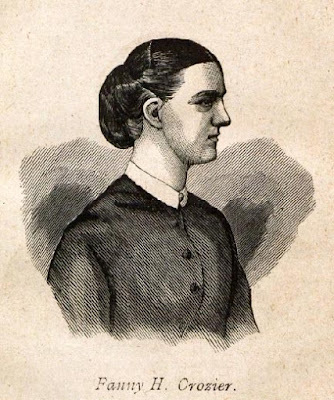 Dr. Barber could have, accidentally or otherwise, given Fanny a prescription that killed her. 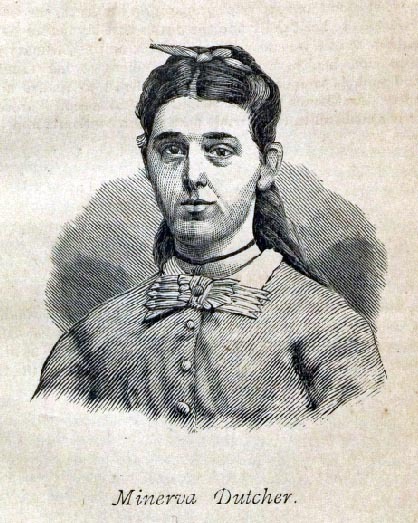 Second, the defense proposed that Fanny Crozier had taken her own life. She was known to have purchased arsenic to kill rats, and the defense claimed that she thought she had stomach cancer and did not want to suffer. It also came out that George Crozier had tried to suborn the testimony of his daughter-in-law, offering her money if she would swear that Fanny had told her she thought she had cancer. The jury deliberated for two hours then returned a verdict of murder in the first degree. Verdict: Guilty of first-degree murder. 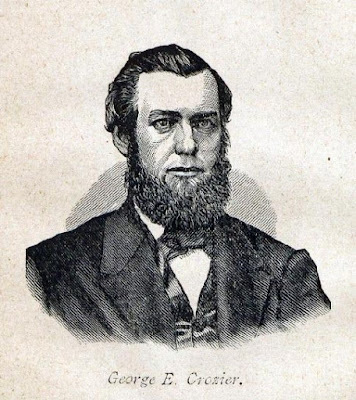 George E. Crozier was sentenced to hang on May 3, 1876. His defense attorneys planned to request a new trial, claiming that the testimony regarding Minerva Dutcher should not have been admissible unless Mrs. Crozier had known about the relationship and disapproved. Governor Tilden granted Crozier a respite until June 16, to allow further consideration of the case. As the defense prepared their arguments, a petition, with the signatures of 800 supporters of George Crozier, was presented to the governor, requesting that he commute Crozier’s sentence to life in prison. The governor agreed to this, with the understanding that there would be no new trial. George E. Crozier spent the next twenty years in Auburn State Prison. He sang in the prison choir and reportedly was a model prisoner, except that he deliberately cut off one of his fingers to be removed from a work detail that he did not like. Crozier died in prison in 1896, at the age of 63. He never confessed to killing his wife. "Crozier Respited." New York Herald 23 Apr 1876. "Crozier to be Hanged." Auburn Daily Bulletin 17 Mar 1876. "Death of George C. Crozier, Wife Murderer, in Auburn Prison." Geneva Gazette 28 Aug 1896. "Uxoricide." New York Herald 19 Mar 1876. TheTrial of Geo. E. Crozier. Penn Yan: Cleveland & Cornell, 1876. New York (State). Legislature. Assembly. Documents of the Assembly of the State of New York: Volume 8. Albany: Jerome B. Parmenter, State Printer, 1877. Find A Grave: George Crozier. Find A Grave: Minerva Dutcher Calhoon.